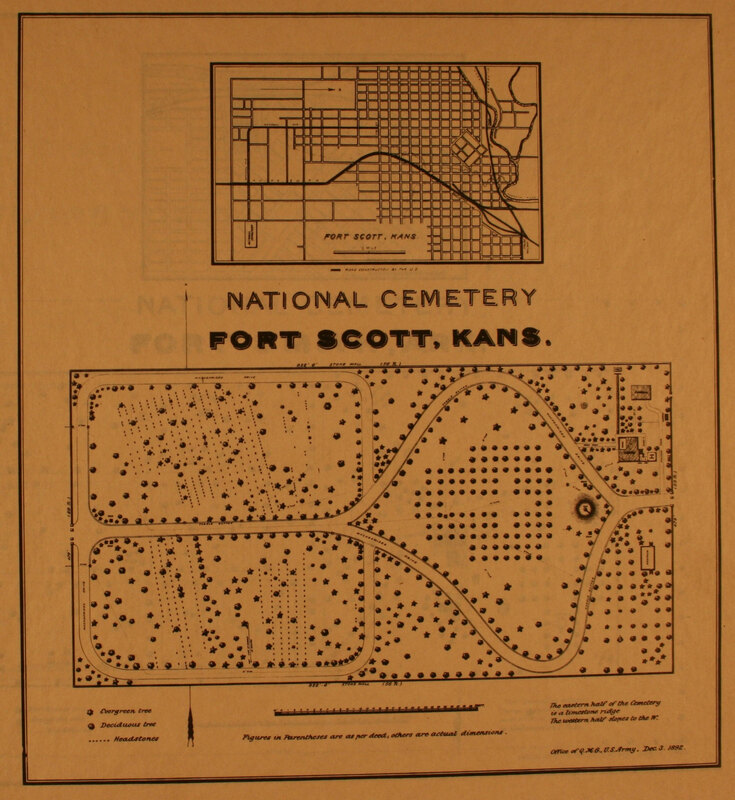 Fort Scott National Cemetery sits two miles southeast of historic Fort Scott, Kansas. Established to protect the Indian Frontier and to keep the peace between local Native American tribes, relocated tribes from the American southeast, and new settlers, Fort Scott sat approximately halfway between Fort Leavenworth, Kansas, and Fort Gibson, Oklahoma, along an important military road. During the Civil War, the post’s cemetery became inadequate. The Federal Government purchased a new five-acre burial plot outside the city, which eventually became the Fort Scott National Cemetery. Founded in 1842 and named for General Winfield Scott, then General-in-Chief of the Army, Fort Scott initially lasted only 11 years before the Army abandoned it. The post cemetery, located approximately 500 yards west of the fort, saw 17 interments of soldiers stationed at Fort Scott between 1842 and 1853. After the fort’s abandonment, the cemetery became a public graveyard. With the onset of the Civil War, the Army reestablished Fort Scott in 1862 as a training center for Union troops, a supply depot for the western theater, and a U.S. Army prison. It became clear that the original post cemetery would no longer be adequate, so the Federal Government purchased a new five-acre parcel of land from the Presbyterian Church southeast of the fort. In 1862, this “Presbyterian Graveyard” officially became the Fort Scott National Cemetery, and in 1867, soldiers’ remains from the post cemetery were reinterred here, most as unknowns. The remains of 16 prisoners from Fort Scott, 13 Confederate soldiers and three Union soldiers who violated the Articles of War, were interred in the cemetery’s prisoner plot. The Union soldiers were later reburied with their comrades in Graves 468-470 while the Confederates remain in Graves 4-16. 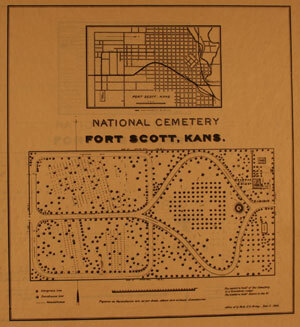 1893 Site Plan of Fort Scott National Cemetery. The cemetery’s original layout consisted of a rectangular parcel of land with the main entrance located at the western end of the property. This entrance, marked by a double wrought-iron gate flanked by stone pillars, led to an east-west axis. The western half of the cemetery consists of regularly spaced rows of graves set at angles off a line perpendicular to the main axis. The pathway continues until halfway through the cemetery where it branches in two, creating the roughly heart-shaped eastern section. Within this section trees were originally planted in an orderly arrangement, 11 rows across by 13 rows down, with a cross-shaped void in the center. Today, this unique landscape feature has been lost. At the eastern end of the former heart-shaped section is the cemetery’s flagpole. The first fence at the site, a simple board fence, was replaced in 1873 by a rough-hewn rock wall, topped with flag stone coping. Built in 1876, the cemetery superintendent’s lodge, designed by U.S. Army Quartermaster General Montgomery C. Meigs in the Second Empire style, features an enclosed porch, brick quoins at each corner, and a distinctive mansard roof. The building now serves as the cemetery’s administrative offices. A utility building, built in 1901 as the stable and tool house, and a brick rostrum, constructed in 1882 and rebuilt in 1931, are also onsite. The rectangular rostrum featured 12 tall columns supporting a flat sheet-metal roof carried on projecting wood rafters. In 1961, the roof was removed and the columns cut down to waist height and the two central columns completely removed. On Veterans Day 2001, the cemetery nearly doubled in size when ten acres of land immediately to the south were donated for future burial sections. This southern portion now includes 11 new burial sections, a committal shelter, and a new entrance. At the western end of the heart-shaped section sits the Ware Monument, the grave marker for Eugene Fitch Ware and his wife Jeannette. Ware served as a Private in the 1st Iowa Volunteer Infantry, and later re-enlisted in the 4th and 7th Iowa Cavalries, serving throughout the Civil War. After the war, Ware moved to Fort Scott, first opening a harness and saddle shop, then a law office, before being elected to the state legislature. Today, Ware is most famous as “Ironquill,” the pseudonym he used as a poet. Before his death in 1911, one of Ware’s final requests was that a natural sandstone boulder be used as his grave marker, an item he chose for its simplicity and inherent beauty. Also at the Fort Scott National Cemetery is the 1st Kansas Colored Volunteers Monument, a gray granite monument resting atop a granite base. The memorial, erected in 1984, is dedicated to the 15 soldiers of the regiment who died in battle near Sherwood, Missouri, on May 18, 1863, and three soldiers from the 2nd Kansas Volunteer Battery. The 1st Kansas Colored Volunteer Infantry was the first African American regiment from a northern state to join the U.S. Army, and the first to engage Confederate forces in battle. During the war, this regiment suffered more casualties than any other from the state. In all, 88 African American soldiers from the 1st and 2nd Kansas Colored Volunteer Infantry are buried at Fort Scott, all in Section 5. Other memorials on site include the Veterans Memorial, dedicated in 1993, and the Combat Infantrymen’s Association Memorial, dedicated in 2003. Seventeen American Indian soldiers who served in three Indian Home Guard Regiments during the Civil War are buried at Fort Scott. These regiments consisted of American Indian refugees who came to Kansas from the Indian Territory in 1861 and 1862. Also interred at the cemetery are 14 Confederate soldiers, all prisoners of war who died at Fort Scott. Twelve Buffalo Soldiers from the 9th and 10th Cavalry and the 24th and 25th Infantry Regiments are buried at the cemetery. Seven are interred in Section 1, and five in Section 5. 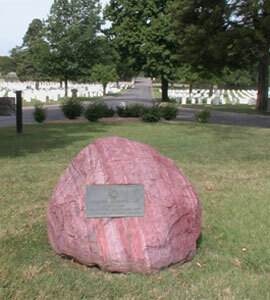 Fort Scott National Cemetery is located at 900 East National Ave., in Fort Scott, KS. The cemetery is open for visitation daily from dawn to dusk; however, limited cemetery staff is present on site. Fort Scott National Cemetery is overseen by the administrative office located at Leavenworth National Cemetery, Leavenworth, Kansas. It is open Monday-Friday from 8:00am to 4:30pm, and closed on on all Federal holidays except for Memorial Day and Veterans Day. For more information, please contact the cemetery office at 913-758-4105 or 913-758-4106, or see the Department of Veterans Affairs website. While visiting, please be mindful that our national cemeteries are hallowed ground. Be respectful to all of our nation’s fallen soldiers and their families. Visitors to the Fort Scott National Cemetery may also be interested in visiting the National Park Service’s Fort Scott National Historic Site, a unit of the National Park System. The site, consisting of the original 17-acre fort site, has been documented by the Historic American Buildings Survey and is a National Historic Landmark. Click here for the National Register of Historic Places file: text and photographs. 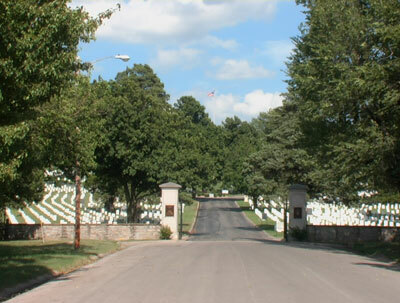 Fort Scott National Cemetery was photographed to the standards established by the National Park Service’s Historic American Landscapes Survey.